How to make Polish pickles the way it is done in Poland. A recipe for homemade Polish pickles that you find in homes all over Poland. These are to be eaten fresh. They are not bottled and processed. Literally everywhere you go you see pickling cucumbers offered. Along with them are fresh dill and garlic. And in the markets and at the vegetable stands you see buckets of them already pickled and ready to eat. Making the pickles is disarmingly simple. It is so easy that people tend to make small batches - almost continually. 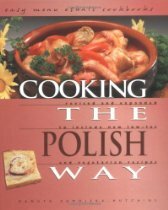 This recipe is perhaps one of the favorites among Polish people. At the markets you see people buying many kilograms of cucumbers to make their own. I make them by the bucket load when I am going for any barbeque or dinner with close friends. They just love them. Adjust the brine to your taste. If you have comments on this recipe, please leave them in the video below. About a kilogram (2.2 lbs) is more than enough to make your first batch. After you see how they come out and how people like them, adjust your batch size. Wash them and put them in a plastic container, glass container or ceramic jug. Cover them with very warm water. Then add 1 1/2 tablespoons of salt per liter of water. Add two or three cloves of garlic - chopped course - meaning big pieces. Add dill. Fresh is best. You can use dried if necessary. Some people use horseradish in place of dill and garlic. Cover the container and put in a dark place for about 3 days. There is no need to refrigerate it. You might consider putting a saucer on top of the pickles to keep them under the salt water. They must be covered. After three days taste one. If you want it saltier, let them perk away. They will eventually get "sour". Polish people love these mouth puckering gems. They are too sour for me. I take them out of the salt when I can eat them without screwing up my face. I put them in water, a little sugar and some wine vinegar. After a day or two they are ready. They don't last long around my place. You can take some of them out, wash the salt and cut them into chips. Then put them in another container with fresh water, a little wine vinegar and a cup or two of sugar. In another day or two you will have some fine, sweet pickle chips. Adjust the sugar and wine vinegar load to your taste. Keep these in the refrigerator. You might see some white froth on the top of the pickles as they cure. Skim it off if you wish. I let it be.